Note: XR is an umbrella term which encompassess virtual reality (VR), augmented reality (AR), and other similar technologies. We are in the process of updating our XR documentation, but for now this documentation refers mainly to just VR. 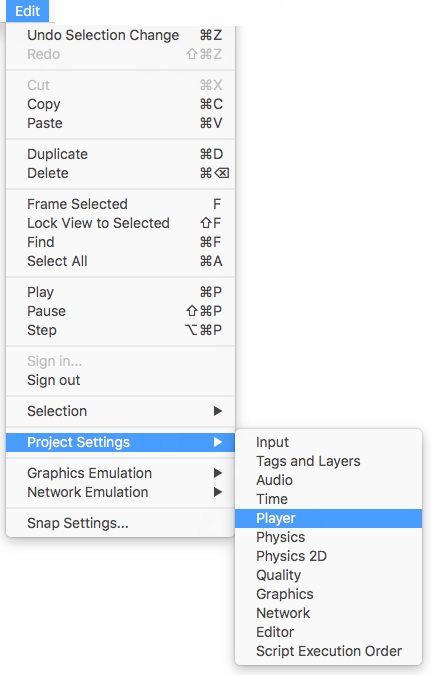 To enable native VR support for your game builds and the Editor, open the Player Settings (menu: Edit > Project Settings > Player). Select Other Settings and check the Virtual Reality Supported checkbox. Set this for each build target. Enabling virtual reality support in a standalone build does not also enable the support for Android (and vice-versa). Your built application initializes and enables devices in the same order as the Virtual Reality SDKs list in Other Settings (see Enabling VR Support, above). Devices not present in the list at build time are not available in the final build. Device None is equivalent to a non-VR application (that is, a normal Unity application) and can be switched to during runtime without including it in the list; the exception to this is None. Unity native VR support does not read plug-ins from within your project’s folder, so including earlier versions of the plug-in with native support will fail if you have VR support enabled. If you wish to use an earlier version with a release of Unity that no longer supports that version, disable Native VR Support (go to Other Settings and uncheck Virtual Reality Supported). You can then access the plug-in like any other 3rd party plugin. 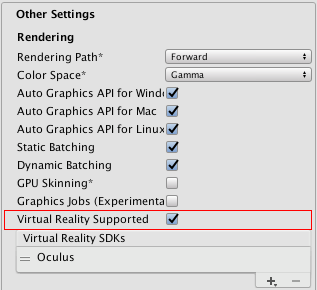 See the section above on Enabling Unity VR Support for more details.